If you, like me, love peanut sauce (and I, like, really love peanut sauce), this is the ultimate way to consume it. Thick, chewy (read: absorbent) noodles dragged through luscious, sweet and slightly spicy peanut sauce, topped with light, crunchy cucumber (for a bit of a break from the richness)—wow. I’m hungry again just writing that sentence. Add more veggies or some protein if you want to round this out into a one-bowl meal, or do as I do and serve it plain (warm or chilled), as a superb side dish. 8 oz. thick Chinese wheat noodles (I also like the ones called “Singapore style” noodles) $1.50 for 14 oz. Boil noodles according to package directions. Rinse, drain and return to the pot. 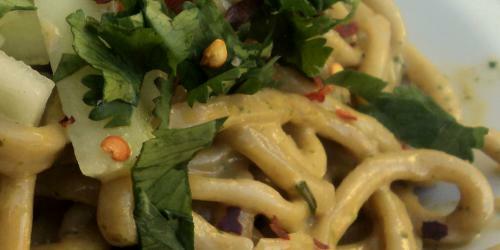 Toss with the peanut sauce until all noodles are evenly coated. Serve, garnished with cucumber strips and cilantro. YUM! I never thought to put cucumber with peanut sauce… I’m intrigued! My sister cooked simple noodles but here this article is about the Peanut Noodle which is new for me. I will taste it and say to my sister to follow the above recipe and direction to make Peanut noodle at home. Its good for all of us who don’t yet tasted.